Note from Ryan: Use the table below to find the correct Flowmaster Super 10 configuration for your car or truck. Not sure which to choose? Follow links to check vehicle fit on Amazon. Flowmaster is a company that has been around for more than 30 years researching and producing quality exhaust upgrades. Their products are available both online and locally in stores. This company offers legendary expertise that will help you get noticed on and off the track. 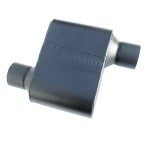 Their popular Super Muffler line has several different options to suit your needs. If you are looking for the biggest sound with the biggest performance the Super 10 is the way to go. 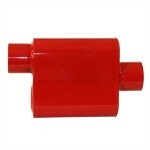 Other popular mufflers include the Super 40 and Super 44. The Flowmaster Super 10 is constructed from durable 409S stainless steel for supreme durability and corrosion resistance finished in a matte black styling. It is also fairly lightweight at 7 pounds with a 6.5 inch body length. 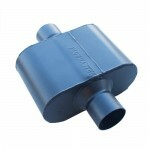 The compact design allows this muffler to be used on a wide variety of cars as long as the setup meets your needs. 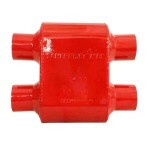 This Super 10 model has non-flanged connections, one 3 inch inlet and dual 2.5 inch outlets. 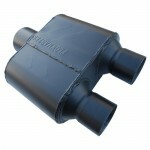 The Delta flow technology from the popular Super 40 and 44 series is also implemented in the Super 10. This Flowmaster patented design along with the absence of internal packing material takes advantage of the scavenging effect to boost airflow efficiency and performance. 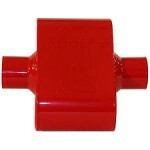 The short single chamber design allows the Super 10 to produce a loud race car tone. 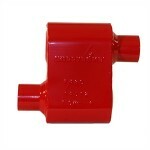 So loud in fact that Flowmaster does not recommend this product for street use but rather off highway or on the track. But that disclaimer hasn’t stopped anyone from using it on the road. Flowmaster couples the great sound and performance with an impressive lifetime warranty. The Super 10 series is Flowmaster’s top of the line muffler that leaves some buyers with an interesting decision. Those who are upgrading from stock have it easy, while those who own previous Super series models are considering making another upgrade to the most aggressive model. That is a testament to Flowmaster’s customer loyalty and satisfaction. Car owners simply want the best and Flowmaster delivers exactly that. Looking for an alternative to the Flowmaster Super 10? 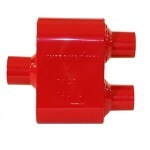 Consider the Cherry Bomb Extreme to take care of your performance muffler needs.